Gregory's 3D Hydro Formed Reservoir is the first hydration system that performs like a soft bladder, but fills, cleans and dries like a water bottle. Gregory &apos;s 3D Hydro Formed Reservoir is the first hydration system that performs like a soft bladder, but fills, cleans and dries like a water bottle. Among other convenience-enhancing proprietary technologies, it features a soft-molded, self-supporting 3D design that prevents contact between the top and bottom layers, dramatically improving drying time and discouraging funky bacterial growth without affecting packability or flexibility. The integrated crescent-shaped handgrip along the top edge prevents the need to hold the top open while filling, and the integrated QuickDry hanger hook allows easy storage and convenient drying after cleaning. 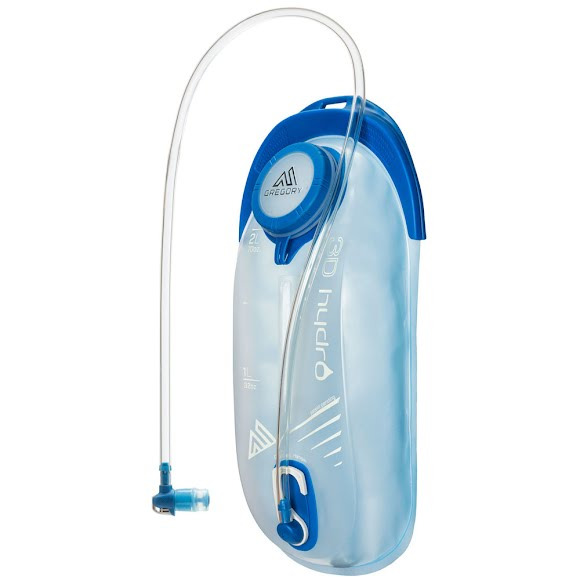 A full-length baffle constructed from the same high-strength, taste-free, BPA- and PVC-free Metallocene PE film as the rest of the bladder prevents barreling and sloshing as you attack the trail, and a positive-click SpeedClip hook inside the hydration sleeve of compatible Gregory bags eliminates hassle when installing or removing the reservoir. As if that werenâ€™t enough, the magnetic DryLock bite valve offers quick, one-handed opening and closing with the simple press of a button, no guesswork needed. Measurements 14.5" x 7.0" x 3.0"